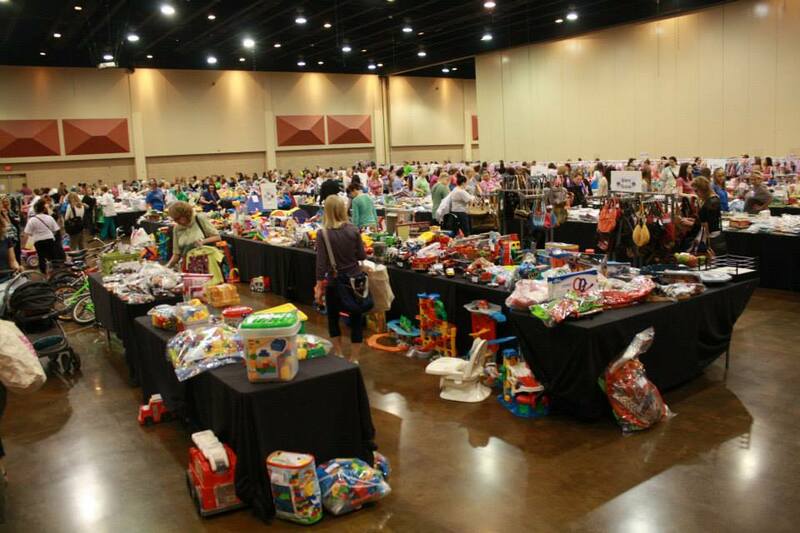 At TUAC we strive to offer the best selection of children’s items that we can by providing the following guidelines on preparing your inventory. To help encourage our consignors to prepare their items we have a 10 for 10 rule – if 10% of your items are unacceptable due to stains, holes, exessive wear then we will take another 10% of your portion. Preparing your items Not only makes a more pleasant shopping experience for you and other shoppers, it also will be more money for you as a consignor – the better an items looks the more likely it is to sell! We are also monitoring toys, equipment and games – if we find that it has missing pieces or does not work (and this is not clear on the tag) you will be issued a warning for the first offense and charged a fee thereafter. We also have to pull items that we find that do not work properly. MIDNIGHT on Wednesday, March 6th. It’s best if you have a good printer, not low on ink, to print your tags. The barcodes you are printing must be readable by the scanner and free of “bleeding” and if you are using a color printer please choose “black and white” when printing. If the barcodes are not scanable this will tremendously slow down drop off, check out, and could make our tracking of your sales less accurate. Tags can be printed on regular typing paper or cardstock. Once you have printed a tag you cannot make changes on the tag by marking through the information, a new tag must be printed and changed in the system. Otherwise when the item is scanned it will not match what is in our computer. If you feel that there will be a problem with your printer or you do not have a printer, we will be happy to print your tags for you for .50 cents per page (8 tags per page) and this money will be deducted from your proceeds at the end of the sale (ex. if you have 150 items it would cost you $9.50 for us to print you tags.) If you ask us to print your tags and choose not to pick them up, you will still be charged. Please click here <mailto:shanna@twiceuponachildconsignment.com> to send us an email to arrange for your tags to be printed and to schedule a time to pick them up. Tags need to be on items before your scheduled drop off. Log on to your TUAC consignor account and click enter inventory. Enter the price and whether you would like to donate the item or discount the item 25% on Friday and 50% on Saturday – discount is for both days only. For a pricing guide click below. Click enter and start your next item. Once you have registered for the current sale your inventory will still reflect items that did not sale in the previous sale. You have some options. If you have items from the previous sale you will now be asked if you would like to bring those items over to the current sale. Please only bring items over that are acceptable for the current sale. (i.e. a bathing suit from the spring sale should not be brought over to the fall sale, but it will remain there until you decide to bring it over for the next years spring sale). You may keep the previous tag. If you want to sell the item again but change the price you must make the change in inventory and print a new tag. If you no longer want to try to sell the item or you no longer have it, you can go in and delete the item. On your list of items it will only allow you to view your 10 most recently entered items. If you would like to view all your items you can check the box just above where your items are listed that says “By default, only the last 10 items entered show. Check here to display all items.” This will show you every item you have entered. You may also want to click the button to “remove all sold items.” This will clear out all items that you sold at the previous sale. To enter new items, enter each item/set that you will need a tag for and include the name,brand, color, and any other details that will help us know the tag matches the clothing in the description, The descriptioin is there to help identify the item if a tag is lost. Please be sure that all snaps are snapped, all buttons are buttoned and all zippers are zipped. This will help you to be sure there are no issues with these parts Our goal is to sell all your items, so the better your items look the better they’ll sell. All clothing must be hung on hangers with the open end of the hanger pointing to the left. We will no longer accept clothing in bags. 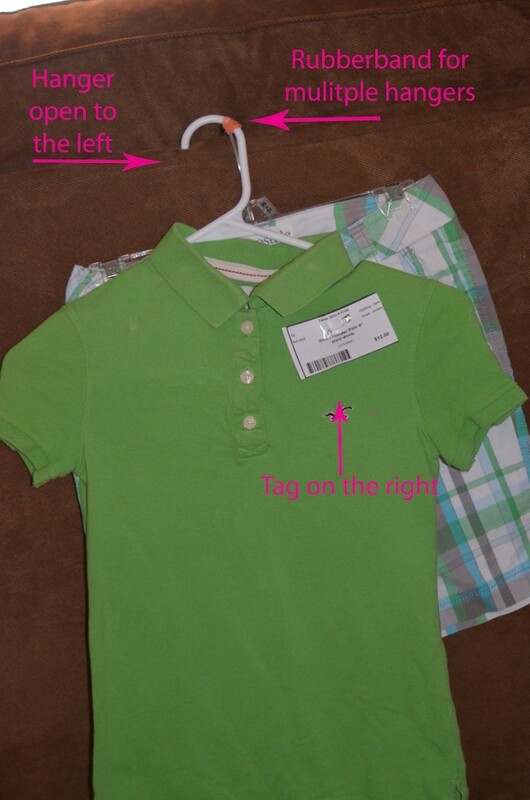 Tags should be safety pinned to the garment’s left shoulder (on your right as you look at the item, see drawing). Do not use tape or straight pins on clothing. Use large safety pins to pin on the tags, (no tiny gold pins), placing the pin horizontally and catching the garment and the tag twice. A piece of tape across the safety pin will help secure the tag and keep it from falling off. You may also use a tagging gun – please use the 1″ barbs so the tags are tighter to the clothing and can be seen easily. Use 2 barbs one in each top corner of the tag. If tags are not pinned correctly or hangers are not open to the left then you will be asked to correct this at drop off. Please use pant hangers with clips or large safety pins to secure pants to hanger. DO NOT USE CLOTHES PINS. If you have a set of 2 or more items please use a rubber band to group hangers together. This group must have one price. Please do not include more than 3 clothing items per tag. We understand that some outfits have several coordinating pieces and it’s nice to keep those together but having several hangers rubber banded together makes it difficult to see all those pieces. If your outfit has coordinating socks, hair bows, etc. group these items together in a Ziploc bag and PIN to the garment. *Tagging Guns – we have had some complaints on the holes in clothing from the tagging guns. If you choose to use a tagging gun please place the barbs in the manufacturer seems or on the tag with the size. Please only do this if you are using the gun otherwise how the picture is showing with the pin. Be sure all pieces and parts are with the toy. Be sure the toy works – if it needs batteries you must include these. A shopper has no way of knowing if it works and will not buy the item without batteries. 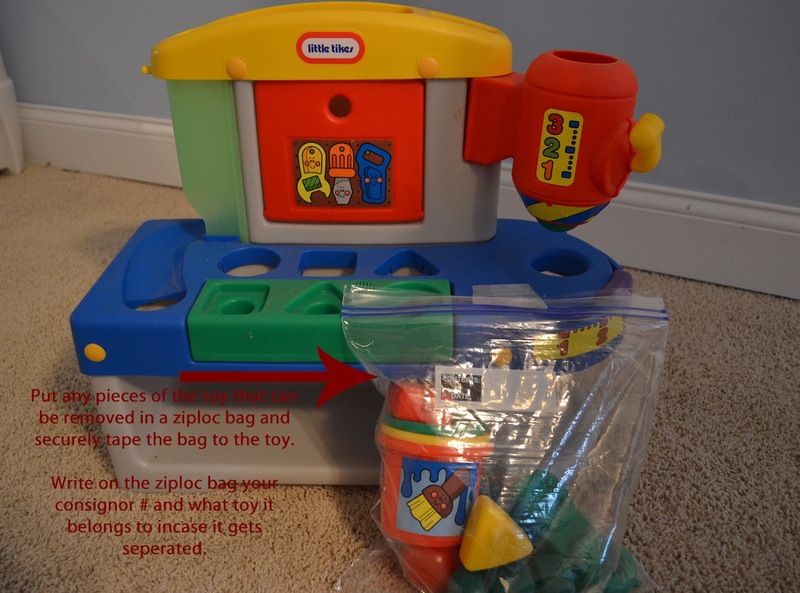 If there are loose pieces with the toy, please place those in a Ziploc bag and attach them to the toy with packing tape or run a string thru the bag and tie it on. Lots of little hands visit our event and they love nothing more to “test” these toys. Secure tag to item with clear packing tape being sure not to cover the barcode and write your consignor number on the bag with the pieces and the item it goes to in case they become separated. *Please check that all pieces are included and the item works — if we find that it has missing pieces or does not work (and this is not made clear on the tag) you will be issued a warning for the first offense and charged a fee thereafter. This has become more of an issue over the last few sales. 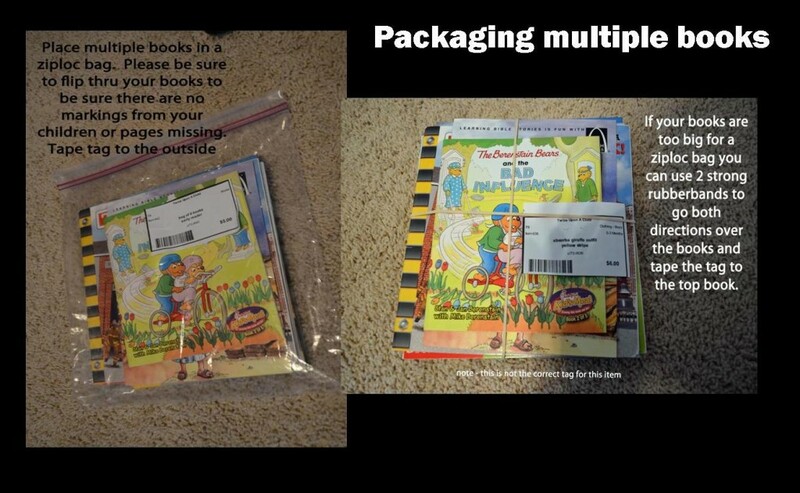 Pack smaller shoes in clear large Ziploc bags (if they will fit) and PIN tag to outside of the bag. 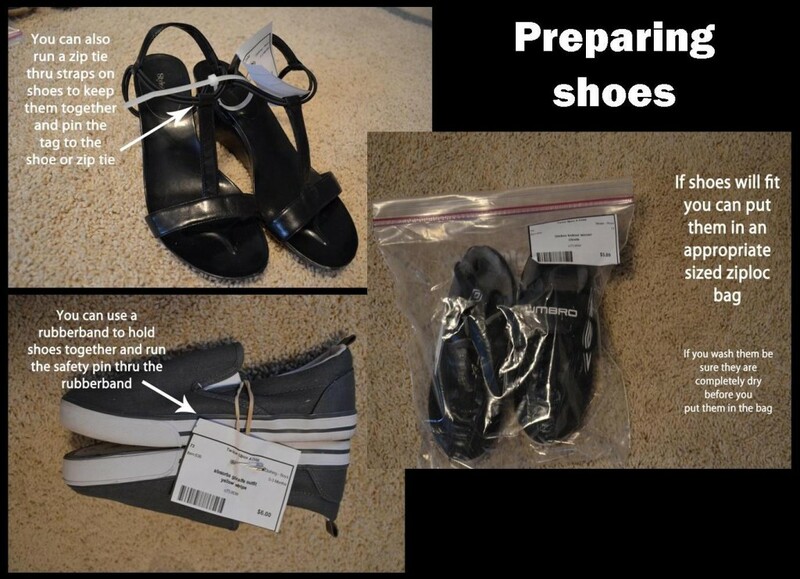 If shoes will not fit in Ziploc, pin them together with a zip tie, then pin tag to the shoe string or appropriate spot. If you have the original box for the shoes, this is fine, just be sure to pin your tag to your shoes, not the shoebox and connect the shoes together with the zip tie. You may also use a rubber band to secure the shoes together. If you wash your shoes please be sure they are dry before you put them in a ziploc bag because they can mildew. Must include batteries. If it does not we will not accept the item. 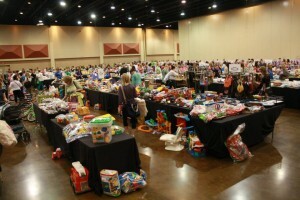 Items such as cribs, pack -n-plays, toddler beds, etc. 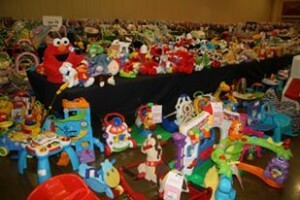 sell much better if they are set up, so please plan on setting up these items at drop off. This will also let us know that all the pieces are included. Remember to check to see if the item has been recalled. Secure tag with safety pin or with clear packing tape being sure not to cover the barcode. Bedding sales best if it is hung across a hanger for shoppers to inspect. You can take 2 hangers together and lay the folded comforter or quilt across it and pin the tag to it. Multi-piece decor sets may be sold as a group OR you may consider offering pieces such as rugs, lamps, and the like individually for shoppers who may want to add one or two pieces to their child’s room without buying the whole set. Secure tag to the outside of the package with clear packing tape being sure not to tape over the barcode. Board games and puzzles in a box MUST include all associated pieces with the box securely taped shut. Puzzles that are not in a box (such as board puzzles) may be covered with cellophane wrap or press and wrap to keep the pieces in place, or put inside a Ziploc bag with the opening taped closed with clear packing tape, tag attached to the outside. Sets of books can be packaged in ziploc bags or with 2 strong rubber bands as pictured.